﻿ Grout Sample Testing | GeoPro Inc.
Grout thermal conductivity is a critical design parameter in ground heat exchanger design. It has a significant impact on not only the length/depth of the bore but also in the subsequent system’s performance. Most geothermal heating/cooling projects are designed using a specific grout thermal conductivity value. It is then the driller’s responsibility to meet that value during loopfield installation. Grout sample thermal conductivity testing is an important component of thermal grout commissioning and quality assurance efforts for every installation. GeoPro, Inc. provides free thermal conductivity testing for any TG Lite or TG Select customer who chooses to take advantage of the service. All thermal conductivity tests performed by GeoPro are “blind”. We do not know the target value for a given sample prior to testing so the results of our tests are not skewed by a desire to give you the answer you want. Instead, we report the actual thermal conductivity of the grout you have installed in your project. This ensures that the test results reported are accurate and impartial. Giving you confidence that the borehole will perform as intended, and providing documented proof that project specifications were met. We guarantee that sample test results will be made available within three (3) business days from when we receive the sample. In the case that the target conductivity is not met, we will work to help determine possible causes for the discrepancy. Each sample container includes paperwork for tracking samples. 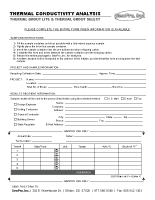 If you have misplaced your sheet, please download and print a copy of the form below.